This well fed lioness, during the time of the Great Migration, was lying by the water after having feasted on a nearby zebra carcass. 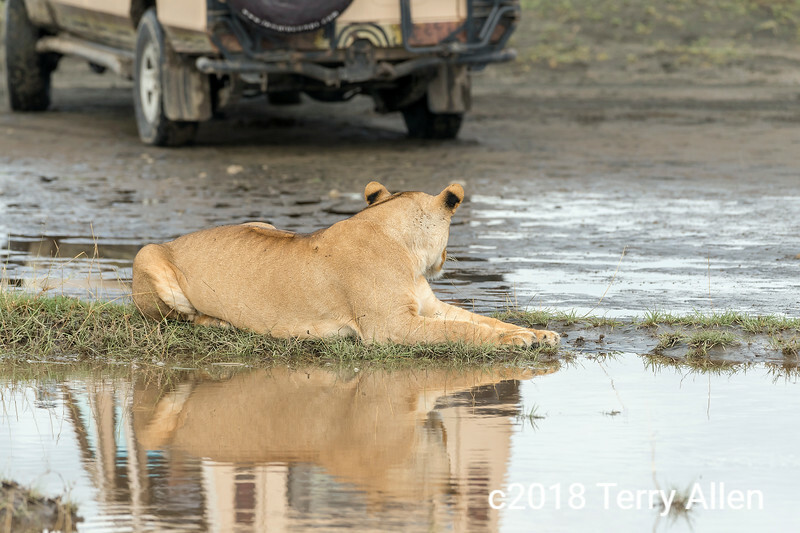 When a jeep came by she barely reacted, just turning her head briefly to look at the jeep and then going back to her original pose looking in downstream (where the carcass was), as documented in subsequent frames. Like the feeling after a Thanksgiving dinner with all the trimmings. Interesting story telling shot about the co-existence of wild animals and tame tourists. Wonderful catch -- love the reflection. If only the lioness would have obliged by looking at the camera, there would have been a fine reflection in the water ! Still, a very interesting image ! She looks perfectly unconcerned about the Jeep, probably because its a common sight for her, and primarily because she has a full belly. This is a wonderful shot of this big cat. Love the reflections of her. She looks perfectly content after feeding on the Zebra.